On any long-term trip, plans can change. Sometimes these amendments are made through choice, sometimes through necessity and, all too rarely, owing to serendipitous urges. In October, we made two significant alterations to our Latin America route for all of the above reasons. The first? We never planned to go to Patagonia on this trip. It seemed like something we couldn't do justice to with our meagre budget and, perhaps, it would be best saved for another adventure. However, who knows when or if our wanderlust will ever bring us back to this part of the world? The second change? We simply couldn't stay in Argentina for longer than a couple of weeks. Originally, we had big plans for the country - particularly a photo project involving gauchos - but after our first few days, it became abundantly clear that our style of budget travel in 2015 just wasn't possible. After much stressing, we both concluded that we'd have to get out of there sooner, rather than later. October actually saw us have some of our worst travel moments thus far but, in writing this post, it's reminded us of just how incredible a month of travel it was. In August, when we first visited the port city of Valparaiso, we knew that it was our sort of place. However, because of house sitting commitments, we weren't able to spend more than three days. Fate would bring us back. During our initial stay, our hostel told us about the Mil Tambores (A Thousand Drums) festival - one of the key dates in the city's calendar. As well as celebrating the start of spring in Chile, the festival was also notorious for the parades on its final day. So, after our Santiago house sit ended at the beginning of October, we took a two-hour bus back to the city. After a number of weeks in relative isolation, we were both pretty excited to return to the unique social environment a hostel can provide (in short we wanted to get drunk and chat to people). It was a roaring success. We shared bottles of cheap red wine on the patio with Chileans, Brazilians, Germans and Argentineans before making our way to 'El Huevo', to dance until 4 a.m. to local bands. This meant that, for the infamous parade day of Mil Tambores, we were a little delicate and drinking was to eschewed for photography. This wasn't a bad thing as events like these are the one place where a street photographer doesn't necessarily have to worry about sticking their camera in someone's face. We took so many photos that day, and will eventually get around to putting together an entire post about this fantastic parade. A return to Valpo also allowed us to make a frankly insane 90-minute round-trip on foot to seek out our favourite empanadas EVER, photograph parts we hadn't visited the first time around and just enjoy being in the city we've dubbed The Chilean Berlin. Pucón was not supposed to be on our itinerary. After Valparaiso, we were supposed to head straight for Argentina. Turns out that photos of Patagonia can be very persuading, as all our plans changed after an afternoon of poring over travel guides; instead of saving Patagonia for a future trip and an increased budget, we would do it in 2015! However, Patagonia is bloody far. So, the sensible thing to do was to take a night bus down to Pucón and spend a few days there (sleeping in a refurbished camper van) before continuing the odyssey. Pucón looks like an Alpine town in Canada or Europe (or at least what films, mainly Dumb and Dumber, have made us think Alpine towns look like) and is a playground for wealthy Chileans and travellers with some cash to burn on adventure activities. As you'll know, we don't really fit into either of those categories. In fact, given that we were putting a significant chunk of our monthly budget on just reaching Patagonia (more on that later) there was very little we could afford to do in Pucón - apart from two things. The first, was getting Andrew some long overdue clothes from a second-hand shop in town. After much rummaging, we got a rather fetching tartan shirt (he is proudly Scottish after all) plus three t-shirts for the grand total of $3,000 Chilean pesos (just under £3) - bargain! The next thing was taking a bus for a day-hike in Huerquehue National Park. Costing us under 15,000 CP all-in, it was an absolutely unforgettable seven hours of hiking in thick snow. We never expected to find such a winter wonderland in Chile! There are three ways to get to Patagonia if you're already travelling in Chile. The budget option is a 30-hour bus, the quickest option is a flight of a few hours, whilst the third is to take a 3-day ferry through some incredible landscapes which works out cheaper than a flight. Although our budget travel style may make the bus seem like our natural choice, we just couldn't face it. After much discussion, we decided that the ferry wasn't only a way of getting from A to B but rather an experience in itself, so we took the plunge on what would, hopefully, be a great adventure. With our cosy little two-bed cabin, three square meals a day (we have never eaten that much food in 24 hours), no internet and perfect sunshine accompanying us, we really enjoyed the experience. Although the scenery was somewhat repetitive in parts and Emily didn't get to see her blue whale, there's no doubt that it was simply stunning, particularly in the early morning when the water had a still, velvety quality. One of the big ticket items in Patagonia that had persuaded us to spend the extra money and travel such distances was Torres del Paine national park in Chile. Its recognised as one of the best hiking spots in the world, with a number of travellers spending 4-5 days trekking the 'W'. However, because of the costs of accommodation in the park, the chilly weather conditions (one chap we spoke with upon his return delightfully told us that his overnight dribbling had actually frozen to his face!) and a general lack of inclination to put ourselves through it, we opted to just see the park in one-day with a tour; something we usually wouldn't do but an alternative which we were both more than happy to pursue on this occasion. Despite the cloud covering the actual main attraction of the park (the iconic towers) we still saw icebergs, glacier lakes, wild horses, gauchos and some gorgeous landscapes. The colours and terrain in Patagonia were truly unlike anything we had seen before and, for this experience along, we already felt vindicated in travelling such great distances to be there. Crossing the border from Chile to Argentina only took a few hours but it all took place during the middle of a snow storm (we had no idea that we would see this much snow in South America). At the border, we received our first indication that, as British nationals, there may be some awkward moments in Argentina. The reason? The Falkland Islands (called Las Islas Malvinas over here) are still a hugely controversial topic in Argentina. The two countries fought a war over them in 1982 (Britain won and kept the islands) but here, particularly over the last decade, there is still rancour. We both knew about this before we arrived, but we were given a stark reminder at the border with this sign (versions of which we would continue to see throughout the country). The photos really speak for themselves. The second big ticket item which had persuaded us to go so far south was this bad boy - the Perito Moreno Glacier, outside the town of El Calafate. Although costing us way more than expected to reach, it was still worth it. We spent eight hours at the site, wandering along the walkways to get different perspectives and views or just sitting in the sun listening to the ice cracking and watching chunks falls into the lake. Our original plan had been to spend a few days hiking the nearby Mount Fitzroy after the glacier, but poor weather (we would have had to hike in 2C!) and higher than anticipated costs in the south of Argentina meant that we had to shelve those plans and, after only a couple of days, head north on a 24-hour bus. As we've hinted at, Argentina was posing us a few problems. We had been so excited for the country but, within our first 48 hours there it became clear that travelling on our budget was going to be very difficult. We've outlined in more detail about the how and the why, but the most difficult day was then we arrived in Puerto Madryn. We had both been hugely looking forward to this place as it is close to two incredible national parks. The first, Peninsula Valdes, is home to hundreds of sea-lions, penguins, guancos and is excellent for whale-watching and the other, Punta Tombo, is the largest penguin colony outside of Antartica. However, the cost of a tour to either of the parks, plus the entry ticket, had increased in 2015 by about 30% from an already high price. It was actually cheaper for us to rent a car for the day to drive to them rather than visit with tour - how crazy is that!? We only had a limited amount of money to spend (given that using our bank cards in Argentina was just stupid) and visiting either of these parks was going to burn through most of that cash - we were miserable and it was clear that, after such a bad start, we were clearly not destined to stay in the country for long. We were both a mess and, for the first time on this two-year trip, felt trapped. We found out that there was a spot you could visit without a tour in order to watch whales, and we thought renting a bicycle would be a lovely way to do it. However, we couldn't even afford to do that. So, as a big f*** you to the country that obviously had it in for us, we decided to walk the 16 kms there and take our chance hitch-hiking back. It worked! A lovely man and his dog actually gave us a lift part way there as it was on his drive to work, whilst on the way back a local called Carlos, picked us up (and spent about twenty minutes discussing rugby and football with Andrew). We also saw nine whales playing in the ocean, only 50 metres or so in front of us. The time we spent walking also gave us both the opportunity to escape the stress we were experiencing and discuss what we could do about the 'Argentine problem'. Although our hope was to be in the country for six to eight weeks, it was clear that we couldn't afford that. So, we completely rehashed our plans. We would take the hit on an overpriced tour to see the penguins, miss out on the other national park, and get the hell out of Puerto Madryn. 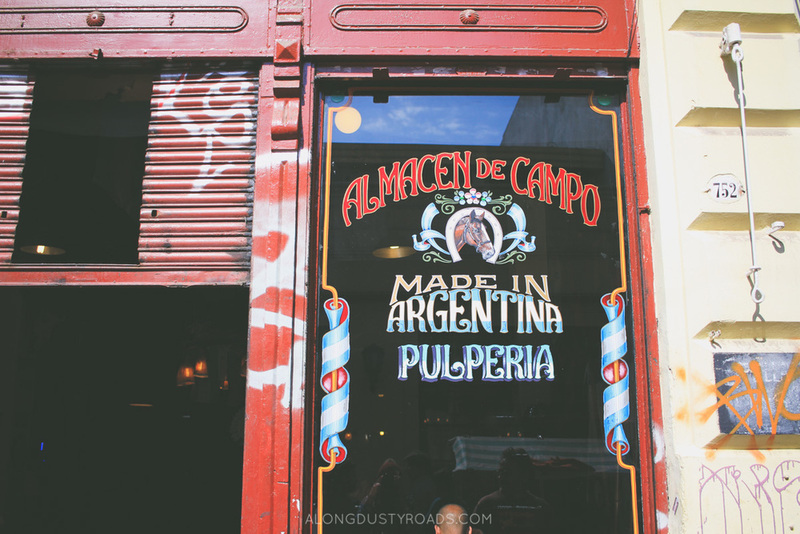 The only other place we would visit in the country would be Buenos Aires. Through pure fluke, we stumbled upon a slightly cheaper tour to the penguins which missed out on all the crap we had no interest in (tea rooms, dinosaur museums) and instead gave us more time with the animals. It also threw in a completely unexpected few hours at Isla Econdida observing elephant seals! Neither of us have been on a safari and both refuse to support zoos so the opportunities to get up close and personal with wild animals has thus far been limited to a couple of rescue sanctuaries and some particularly friendly parrots. So, when our tour guide led us across the beach to sit directly behind the seal colony he barely needed to tell us to keep quiet - we were awestruck! A few hundred photos and an hour later we had seen the alpha-male defend his territory, week old pups demand food and a couple of females have a tiff. 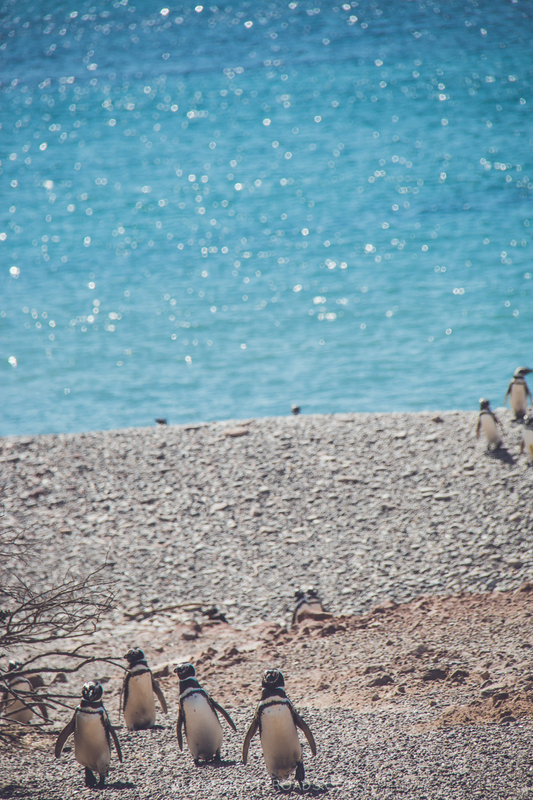 Being the second largest penguin colony in the world, we expected to see plenty of the little guys at Punta Tombo, but the brief guide book descriptions couldn't have prepared us for what we saw. Set out more like a massive housing estate in the desert for penguins, there were literally hundreds of thousands of the little critters, often found under bushes protecting their eggs or waddling to/from a dip in the sea. Despite the exorbitant entry price, it was so lovely to have been able to spend time as guests in their little penguin world. Even after making some relative peace with the country, it still hated us. We've had all sorts of transport on this trip, so we're both pretty tolerant and flexible. However, the 24-hour bus journey from Puerto Madryn was not only the most expensive we've had in nineteen months, but also the worst long-distance bus journey we've experienced in Latin America. The bus wasn't road-worthy and the heating system didn't work. This meant that we were both freezing during the night and sweltering during the day as there was no air-con and only two windows would open. Of course, as we've come to expect, there was no apology for this but, my god, we were both happy to get off! i want to BA BA BA, Buenos Aires! Although we had decided that the curtain must fall on our time in Argentina much sooner than anticipated, we weren't ready to say goodbye yet. And as it turned out, the Gods were finally on our side, and the time we spent in the country's capital was utterly fantastic! Having been travelling at quite a rate for the previous few weeks, we were desperate to get out of dorms for a little while (we couldn't afford privates). As luck would have it, AirBnB was CHEAPER than staying in a double room in a hostel. We found a great little studio apartment in the centre of Recoleta with lots of space, a balcony for evening glasses of wine, a full kitchen, and most importantly in a country that charges up to $10 for a load, a washing machine of our very own. Ohhh, did we take advantage that bad boy! In between ticking off the big tourist draws like the Recoleta Cemetery, La Boca and Plaza de Mayo, we indulged in a lot of empanadas (some of the best in Buenos Aires, we've been told), pizza from a place that's been open since the 30s and cannolis from a little patisserie that's been open even longer than that. There were coffees on sidewalks, beers in the afternoon sun whilst watching live tango, unique jewellery finds in famous markets and a few hours whiled away in the second best bookshop in the world (the Guardian's words, not just ours!). A great apartment gave us the chance to get some work done, and we proved yet again to ourselves that we really can make a home anywhere. In fact, had the owner not had a reservation for the following day after we checked out, we'd probably still be there. So, Argentina, thank you from the bottom of our hearts for proving in the end just why were so keen to cross your border to begin with. Buenos Aires, you may not have seen the last of us! Having our own apartment (which we could pay for on-line) and experiencing Buenos Aires at our own speed meant that our money lasted a little longer than expected and we successfully avoided using our cards or an ATM. Our final stash of dollars and pesos was scraped together to purchase ferry tickets which would bring us across the water to Uruguay, where we'll be spending most of November. So, it is here, in beautiful Colonia where this month ends. What does the next have in store? read more of our latin american adventures here!